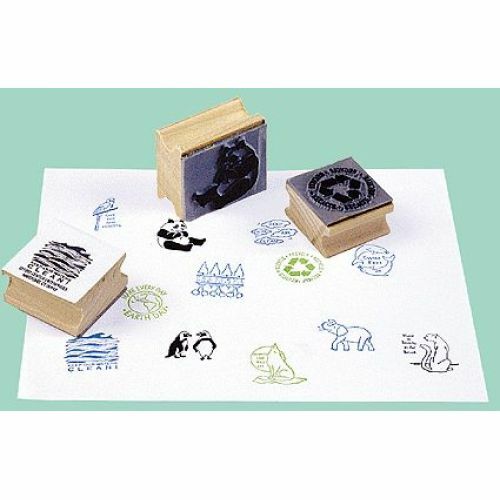 Our set of 12 rubber stamps teaches students to be responsible for the environment. These high quality stamps make the students aware of the need to conserve. SET INCLUDES: A PANDA BEAR, "KEEP OUR AIR CLEAN" CLOUDS, "SWIM FREE" DOLPHINS, ELEPHANT, "RESPECT OUR WILDLIFE" WOLF, 2 PENGUINS, "KEEP OUR WATERS CLEAR" OCEAN WAVES, "THERE IS BEAUTY IN THE BEAST" PANTHER, "MAKE EVERY DAY EARTH DAY" GLOBE, "SAVE THE RAIN FORESTS" BIRD, "RECYCLE" LOGO, AND "PERSERVE OUR FOREST" TREES.